The first UK capacity auction was concluded just in time for Christmas. The auction results gave little in the way of Christmas cheer for most UK generators, with the clearing price close to half that of market consensus expectations. Ironically the auction results may undermine UK security of supply over the next 3 years. However the first auction marks the start of an important transition of Europe’s larger power markets towards market based mechanisms to remunerate flexible capacity. The first UK capacity auction was concluded just in time for Christmas, with 49.3 GW of capacity procured at a clearing price of 19.40 £/kW. The auction results gave little in the way of Christmas cheer for most UK generators, with the clearing price close to half that of market consensus expectations. However the first UK auction marks the start of an important transition of Europe’s larger power markets towards market based mechanisms to remunerate flexible capacity. The conditions that set up the downward price pressure in the auction stemmed from a relatively low government capacity target that saw an ‘oversupply’ of existing capacity. Existing capacity volume (54.9 GW) exceeded the procured volume in the auction (49.3 GW) by 5.6 GW. 2.8 GW of new capacity was successful in obtaining capacity agreements despite the low auction clearing price. But this meant 8.4 GW of older existing coal and CCGT plants failed to secure a capacity agreement, leaving plant owners in a precarious position. The auction outcome is being heralded as a success by the government (‘capacity procured cheaply for the consumer’). But it is unclear whether the first auction has done anything to improve UK security of supply over the critical period of market tightness from 2015-18. In fact the outcome may have exposed one of the key weaknesses in the capacity market design, where capacity is procured on the basis of uncertain forecasts of conditions four years in advance. This leaves little ability for the capacity market to respond to market tightness over the next 3 years. National Grid has published plenty of data on the 1st auction outcome. Rather than duplicating any of this analysis, our intention in this article is to focus on the key lessons learned from the auction and the implications for evolution of the UK power market. How did the auction results match our expectations? Marginal plant: 3 key plant types are likely to drive the 1st auction outcome (older coal, older CCGT, low capex peakers). Pricing: Our analysis indicates a 1st auction capacity price around 30 £/kW if participants bid rationally to recover costs. But the 1st auction outcome will come down to EM (&CM) expectations (diverse range likely across players). Downside risk: The low 1st auction target and ‘Fear of Missing Out’ dynamics may lead to a lower clearing price than expected. These factors could easily combine to reduce the 1st auction clearing price by 5-10 £/kW. Older plant: 6-8 GW of older CCGT/coal to be unsuccessful in 1st auction → most of this uneconomic without capacity returns. Energy market impact: It’s likely a significant volume of older capacity is closed/mothballed as a result, supporting wholesale energy market generation margin recovery. The auction outcome was broadly consistent with these expectations. However the downward price pressure dynamics were somewhat stronger than we had expected, resulting in a lower clearing price (19.40 £/kW) and higher level of unsuccessful older plant (8.4GW). We also expected a higher volume of coal capacity to be successful in securing 3 year refurbishment agreements with a view to covering the costs of IED capex. The fact that a number of existing coal plants missed out on refurbishment agreements raises a query as to the economics of IED cost recovery if these plants are going to remain open in the 2020’s. The Carrington CCGT project did not secure a capacity agreement despite already being under construction. Sunk cost dynamics were perhaps trumped by expectations of higher capacity returns in the future. One of the other new CCGT projects, Carlton Power’s Trafford plant (next door to the Carrington plant), was successful in the auction. This suggests that there may be some unique benefits to this project (e.g. low capex, synergies with the Carrington project construction) as well as one of the parties to the project taking a very optimistic view of the evolution of the wholesale energy market. The success of the Trafford CCGT project raises an important question going forward. Was this an anomaly, or can we expect significant volumes of new build CCGTs at lower capacity prices (e.g. < 40 £/kW). We suspect the former. We also note that it is one thing to secure a capacity agreement, but this does not guarantee an ability to raise the capital, secure offtake contracts and construct and commission the plant. While the specific bids of each plant have not been released, Grid has published a representation of the supply stack shown in Chart 1. 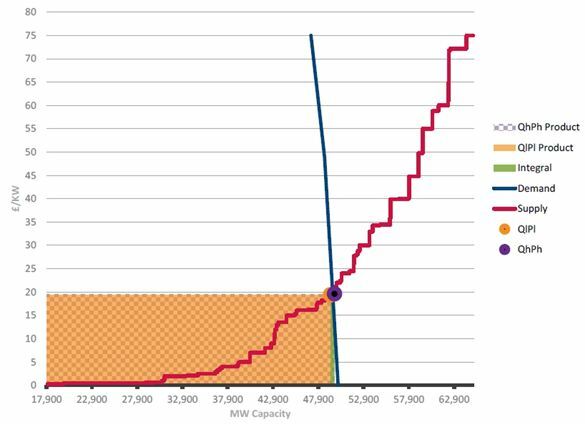 As expected, around 30 GW of existing capacity did not require capacity support and was bid into the auction at zero price. The supply curve looks to be quite steep above the marginal clearing price. For example if another 4 GW of capacity had been procured, the clearing price would have risen towards 35 £/kW. There looks to be a reasonable level of price support (5-6 GW of capacity) below the clearing price around the 15-20 £/kW level. This is likely to represent owner bidding to reflect the direct fixed cost recovery requirements of thermal plant. The ‘blockiness’ of the supply curve above 35 £/kW suggests the more expensive tail of the stack was dominated by a number of larger thermal units (both existing and new build). The finer granularity definition of capacity volumes in the 20-35 £/kW bid range suggests that there may have been a reasonable supply of smaller scale peaking assets sitting above the clearing price, but below many of the larger thermal unit bids. The subsequent actions of plants that failed to secure a capacity agreement are likely to be as important as the auction outcome itself. Without any capacity price support, the economics of many of the older coal and CCGT plants that failed to secure an agreement do not look healthy. This is particularly true of the 3.9 GW of older CCGTs which have been suffering cash losses for several years now. Owners have been holding on for capacity payments. So it is likely that a weak auction clearing price will crystallise plant economics. Expect plant closures and mothballing over the next two years. Somewhat ironically, if a substantial volume of plant that was unsuccessful in the auction closes (e.g. 4-5 GW), the auction may have actually worked to undermine security of supply over the next three years rather than improve it. In this scenario it is likely Grid will take action to secure additional reserve capacity. This brings the new Supplemental Balancing Reserve (SBR) contracts into focus. While Grid can use SBR as an emergency capacity back stop, SBR contracted assets are removed from competing in the wholesale energy market supply stack. This means plant closures are likely to drive higher rents and generation margins in the energy market despite SBR contracting (as we set out here). In a sense SBR may become a temporary capacity market over the 2015-18 period, albeit one that lacks transparency and a clear set of rules. As we have said many times previously, once the government starts overlaying complicated market interventions, the unintended distortions that result tend to generate the requirement for further intervention.